One of my hubby's all time breakfast favorites is my French Toast Casserole. He absolutely loves it. It is simple to make and really tastes great. I made it for him recently and decided to share with you all how I make it. Preheat your oven to 350 degrees. Melt your butter and pour it into a cake pan to coat the bottom. Line the bottom of the pan with the slices of bread. Now, in a large bowl, mix together the eggs, milk, sugar, salt and vanilla. Lay 6 pieces of bread in the bottom of the pan. Pour over the bread and let sit about 5 minutes to soak in. Then lay 6 more pieces of bread on top and pour the rest of the milk mixture on top. Finally, sprinkle the cinnamon and nutmeg over the top. Bake for 40 minutes. 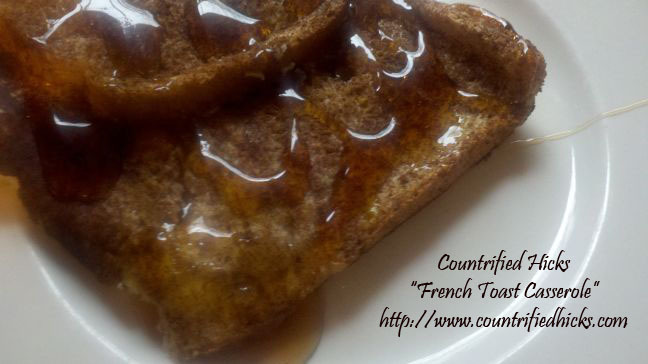 This French Toast Casserole goes great with a cup of Countrified French Vanilla Coffee! Hi I found you on the Blog hop. Now following you. Please stop by and say hi when you get a minute. have a great week. :) Please check out my new Weekly Goals Blog hop. You can find it here. http://lenettacarnes.blogspot.com/2013/01/weekly-goals-linkup.html#more Would love it if you would link up with me. Have a great evening. Lenetta, thank you for becoming a follower. I went to your site and followed you back. Love the sense of community! Looking forward to making that, thanks for posting. Thank you for sharing with the Clever Chicks Blog Hop this week; I hope you’ll join us again! Kathy, thanks for stopping by and allowing me to link up with you each week. I'll see you again next week! How wonderful! I'd love to have you come share some of your projects at my link party that just went live! Nancy, thank you for letting me know about it. I will put it in my book and try to link up each week. Heading there now! this looks really good! I saw you over at It's a Hodgepodge Life. You have some very interesting stuff on your blog and I'm happy to be following you via GFC and looking forward to more! Danni, thank you and I appreciate you stopping by. I went and followed you back. I love how blog hops connects us all! April, thank you so much for letting me know about your very 1st link up party. I will go there next and post. I love french toast, but never tried making it this way. Thanks for sharing your recipe! 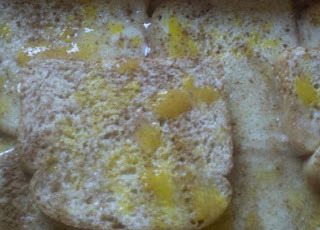 Brandi, thanks for stopping by and believe me, this is a super, easy way to make a bunch of French Toast. Thanks for linking up to last week's Tuesday Confessional! Your post has been featured, so head over and grab a brag button! Macy, thank you so much for letting me know. I am so excited! Can't wait to put the button on my blog!!! Ali, Sounds great to me. I love linking up with you! This has got to be delicious!! This sounds like a good breakfast treat! Thanks for sharing and linking back to Foodie Friends Friday. New like here, too! Cindy, thanks for stopping by! This looks so good! Pinning. My family loves breakfast for dinner. Will definitely be making this. Visiting from Sew Can Do. Cyndee, thank you for stopping by and pinning this recipe. I appreciate it very much! Lisa, thank you so much. Your site has such great info and link ups. I never try to miss it! What a great breakfast or brunch recipe. Thanks for sharing. Yum. This looks amazing!! Thank you for linking up! Thank you for allowing me to link up and for dropping by my blog! There is nothing better than making something in one dish like the. I love it. Now you don't have to stand over the stove making a few at a time. Thanks for sharing on Foodie Friends Friday. Marlene, I love one dish/pot cooking myself. Thank you for hosting this hop! Thanks for linking this up! I bet my husband would love this as he's a French Toast guy too! I love french toast but have never tried it as a casserole. This just seems so easy! I am totally going to try it. Thanks for sharing the recipe and thanks for linking up to Making Your Home Sing Monday! Thanks for the opportunity to link up with you. It is easy and so delicious. Have you had a chance to try out the recipe yet? If so, how did you like it? Looks delicious...that last picture hooked me! I love a recipe that uses ingredients I always have on hand. Thank you Kimm. So glad you dropped by and liked the pic and the recipe. So thankful you allowed me to participate this week!